Let’s say, hypothetically, that nearly every stand at your local farmers market is teeming with perfectly formed, bright green little zucchini — any and all of which could be yours for a mere $1 a pound. How much do you buy? Right. A lot more than what’s pictured above. Because it seems silly to hand your friendly neighborhood farmer just one measly dollar and be on your way. I mean, this is food we’re talking about. My point is that we’ve been eating a lot of zucchini lately. But when Chris wandered into the kitchen yesterday and groaned, “You put zucchini in cookies?” (I did. I don’t recommend it. ), I thought it might be time for a frozen pizza. Not for me, of course. I could eat zucchini every day from now until the blizzards come. 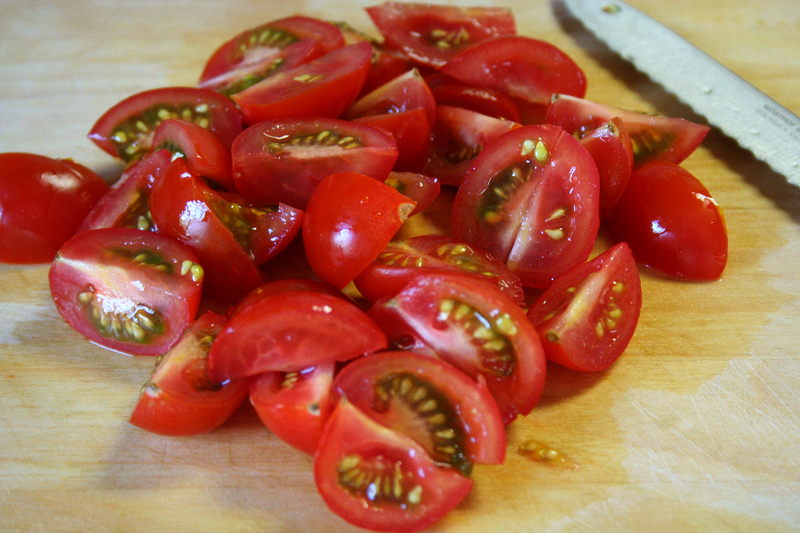 Plus I had a pint of four-day-old cherry tomatoes languishing on the counter and quite a bit of shredded zucchini left over from the aforementioned cookie debacle. And even after carefully tending to 107 marginally tasty chocolate chip zucchini cookies, I wasn’t entirely convinced I’d spent enough time standing around in the kitchen. So I made risotto. I got a nice little zen thing going with the stirring, and damn that risotto was good. The zucchini provided just the slightest hint of crunch, and the tomatoes infused the rice with their umami goodness while still retaining some of their texture and shape. With its thirty or so minutes of active time risotto may sound a bit daunting, but if you don’t mind fairly continuous stirring it’s actually pretty easy. I can’t make Minute Rice to save my life but I’ve got risotto down. This will be made again. Possibly tomorrow. 1) Melt the butter in a medium saucepan over medium heat. Add the onion and cook, stirring occasionally, about 5 minutes until it softens. 2) Add the rice and stir until it’s coated – about 3 minutes. Season with salt & pepper, then add the wine, stirring until the liquid has nearly bubbled away. 3) Use a ladle or measuring cup to add the warmed stock 1/2 cup at a time, stirring occasionally until most of the stock has been absorbed. Add additional stock as each new addition is absorbed, stirring frequently but not constantly. 4) Taste the rice after about 20 minutes. When it’s almost al dente (this could take closer to 30 minutes than 20), add the zucchini and tomatoes along with the last 1/2 cup of stock. Once the stock has been mostly absorbed, remove from heat, add the basil and parmesan, and stir to combine. This entry was posted on July 23, 2008 by Megan @ When Harry Met Salad. It was filed under rice & other grains and was tagged with risotto, tomatoes, vegetarian, zucchini. I am seriously, seriously impressed, lady. Photography, cooking, putting up with Chris — does your patience and selflessness have any end? This is a gorgeous, gorgeous space. I’m already in lust. Inspirational…love it…want some more of it…! Yeah, you gotta throw us guys a frozen pizza ONCE in a while. Yum. We’ve been grilling veggies like crazy around here. I love zuccini bread. Maybe a soft cookie with zuccini and some spice – maybe even raisins would be yummy. Don’t quit on the cookie idea. You are on to something. MizBubs used to have a really good recipe for zuchini bread–it was sweet and moist like pumpkin bread. I’ll have to ask her about that. Those pictures are wonderful. We’ve never made a risotto. Maybe we’ll try that now. The risotto looks scrumptious! Too bad the cookies didn’t work out, I love the idea of it. I just made chocolate zucchini bread and muffins recently. They were yummy. The cookies actually taste pretty good, it’s the texture I wasn’t crazy about. 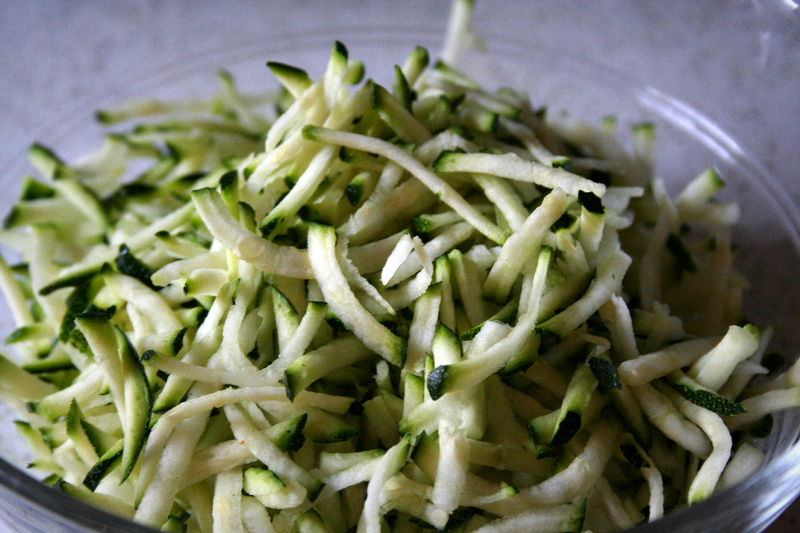 The zucchini gives them a soft, puffy, fluffy texture and I prefer dense, chewy cookies. I may keep working on it. 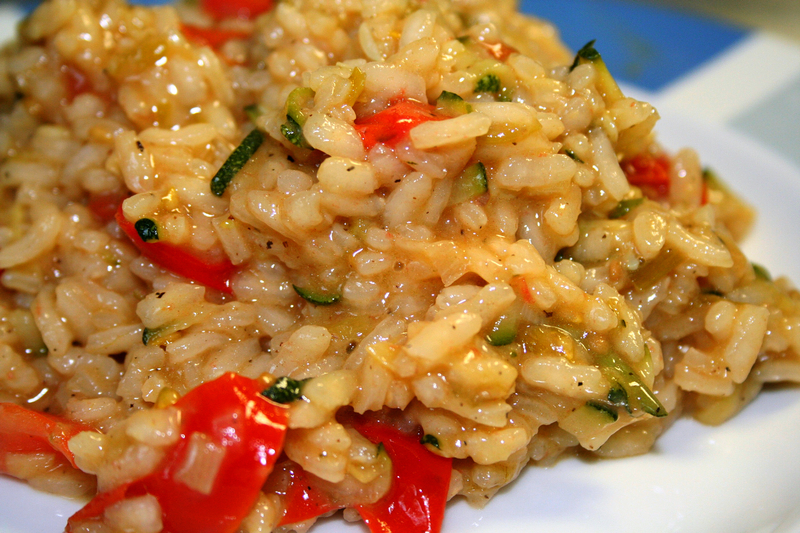 Being a vegetarian, risotto is frequently the one entree on the restaurant menu for me. Fortunately, I could eat it 3 meals a day for the rest of my life and be just fine. I have to say that I actually enjoy making risotto as well. I tend to make heavier mushroom-based risottos, and the idea of making a fresher-tasting one like this one is really appealling to me. When I make enough to have leftovers, I add a little egg and make risotto pancakes for breakfast. Yum! The photos of the food is the best part – I have to go out and buy some cherry tomatoes now, just because the photo made me hungry for them. Good luck on getting Chris to eat Zukes, and I’m so glad you’re back in the kitchen blogging. when making the risotto is there anytime you need to put the lid on the pot? or keep the lid off the whole time? Keep the lid off the whole time! You’ll be stirring and adding stock for pretty much the whole process, so it’s mostly hands-on, active, no-lid time. Good luck!